Villa Giannis is an attractive old country residence, which dates back more than 800 years, and is to be found in the centre of the beautiful ancient hillside village of Maroulas, 6 km south-east of Rethymnon. The house has been very recently lovingly restored to its former character and style. The traditionally furnished house is 70sqm in size and is suitable for 4-6 people. On the ground floor there is a well-equipped kitchen with a small dishwasher, and a dining area. A few steps lead down from here, where to the right there is a bathroom with bathtub, shower attachment and WC, and to the left there is a round dining table and a seating area with fireplace. A wooden staircase leads up to an open plan sleeping area with a double bed. A further two double bedrooms, each with air conditioning (extra local charge), share a balcony with views over the village and to the sea beyond. 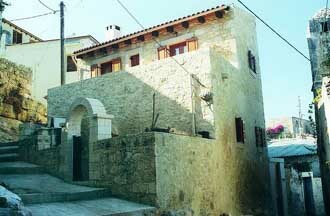 At the entrance of the house there is a little courtyard with an old wood-burning oven, which can be used by guests. In the village of Maroulas, well known for its handsome mellowed stone Venetian buildings, there are three tavernas and two traditional Greek kafenions. The beach is approx. 3 km downhill from the villa. Car hire is recommended.